Details of the Umpleby family in the Grewelthorpe area.Research started March 2015. Latest update Jan 2019. ARTHUR UMPLEBY. born C1864 Wath Pateley Bridge. Married to Eleanor of Glasshouses in 1887. Living near corn mill. Birstwith 1901. He was a flour miller. In 1911 he was a grocer & dealer. Living Minskip. They had 8 children. 2 died before 1911. ARTHUR LEONARD UMPLEBY Born C1866 Eavestone. Son of John & Jane. ARTHUR HANLEY UMPLEBY. Born 1888 Boroughbridge. Son of Arthur & Eleanor. In 1901 he was a Railway Clerk. ARTHUR GEORGE EDGAR UMPLEBY. Born C1897 Sheriff Hutton. Son of George P & Jane Elizabeth. CHARLES UMPLEBY Born c1855 Thornmaster. Married to Mary of Kirkby Malzeard. Living Settle 1901. Father of William & Alice. DOROTHY UMPLEBY. Born C1803 Kirkby Malzeard. Died March 1857 Dallowgill. Dau of Richard & Mary Craven. Married Christopher Lofthouse. in 1822. EDGAR COWLING UMPLEBY Born C1903 Boroughbridge. Son of Arthur & Eleanor. EDITH MAY UMPLEBY. Born C 1893 Sheriff Hutton. Dau of George Parnaby & Jane Elizabeth. EDNA UMPLEBY [Nee Hardy]. Born 4 Nov 1934. Dau of Harold Hardy & Louisa of Hammersgill Farm Ellington. ELEANOR UMPLEBY. Born C1892 Boroughbridge. Dau of Arthur & Eleanor. ELIZABETH UMPLEBY. Born 1830 Melmerby. Dau of Leonard & Jane Bradley. ELIZABETH UMPLEBY [NEE ?]. Born C 1852 Masham. Married to Joe [the woodcarver] of Leeds. ELIZABETH LAVE UMPLEBY. Born C1860 Eavestone. Dau of John & Jane. ELLEN UMPLEBY [nee ?] Born C1834 Grantley. A widow living in Alms Houses Kirkby Malzeard in 1901. ELLEN UMPLEBY. Born May 1849 Kirkby Malzeard. Dau of George & Margaret Imeson. Married to  ? Lansdale. Then in 1887 in Manchester to  Peter Ryan. ELLIS D. UMPLEBY. Born C1875 Huddersfield. Son of Joe [woodcarver] & Elizabeth. Ellis was a wood carver. ELSIE GLEW UMPLEBY. Born C1902 Sheriff Hutton. Dau of George P. & Jane Elizabeth. EMILY LAURA UMPLEBY Born C1869 Eavestone. Dau of John & Jane. GEORGE UMPLEBY. Born C1814 Dallowgill. Died Oct 1886. Son of Richard & Mary. Married to  Margaret Imeson. in 1834. Then  Mary. Had son Richard a brewer. GEORGE UMPLEBY. Born C1837 Idle. Living Dallowgill 1901 with brother Richard. GEORGE PARNABY UMPLEBY Born C1863 Eavestone. Son of John & Jane. Married in 1891 to Jane Elizabeth of Masham. Living Hawsham in 1911. HANNAH UMPLEBY Born C1840 Dau of Leonard & Mary. HUBERT UMPLEBY Born C1904 Minskip. Son of Arthur & Eleanor. IDA UMPLEBY Born 1889 Boroughbridge. Dau of Arthur & Eleanor. JANE UMPLEBY Born 1827 Melmerby. Died 1900 K.Malzeard. Dau of Leonard & Jane Bradley. Married in 1854 to John Burrill of Dallowgill. JANE UMPLEBY [Nee ?] Born C1834 Eavestone. Wife of John of Melmerby. JANE UMPLEBY Born 1855. Dau of Leonard & Mary. JANE ELIZABETH UMPLEBY [nee ?]. Born C1869 Masham. wife of George Parnaby Umpleby. of Sawley. JOE UMPLEBY. Born C1853 Leeds. Son of Richard & Caroline. Wood carver married to Elizabeth of Masham. Living Huddersfield in 1891. JOHN UMPLEBY Born C1822 Ripon. In 1891 he was an inmate in York Workhouse. which was at Clifton. JOHN UMPLEBY Born 1825 Melmerby. Son of Leonard & Jane Bradley. Living Grewelthorpe 1851. Married to Jane of Eavestone. JOHN WILLIAM UMPLEBY Born C1854 Ripon. Died 1879. Son of Leonard & Mary Ann. Married Ann Leeming. Living Grewelthorpe in 1901. JOSEPH B. UMPLEBY. Born C1843 Otley. Killed 1905 see article below. 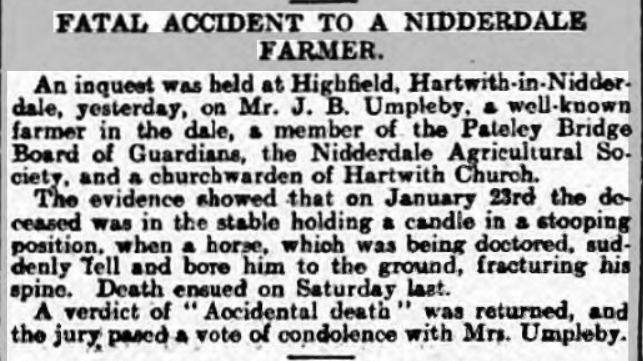 In 1901 living with his sister in law Jane Ridsdale on Highfield Farm, Hartwith. KATHLEEN MARY UMPLEBY Born C1900 Boroughbridge. Dau of Arthur & Eleanor. LEONARD UMPLEBY Born 1780 Carlsmoor. Grewelthorpe. Died 1861. Son of Leonard & Sarah Burrill. Married Jane Bradley of Sawley. in 1808. LEONARD UMPLEBY Born C 1814 Grewelthorpe. Died 1886. Married to Mary. Farmer. Parents of William. LEONARD UMPLEBY. Born C1827 Kirkby Malzeard. Married Mary Ann in 1870. LEONARD UMPLEBY Born C1850. Died 16 July 1931 aged 81. Son of Leonard & Mary. Husband of Jane. Buried Kirkby Malzeard, Lived Cliff Farm. Grewelthorpe. LEONARD UMPLEBY Born 7 June 1877. Ilkley. Nephew of William & Ann. Living Carlsmoor in 1911. In 1939 Married to Kate [born 1891]. Living Low Farm Dallowgill. LEONARD UMPLEBY Born 3 May 1910 Grewelthorpe. Son of Leonard & Lily Jane. LILY JANE UMPLEBY – Born C1878 Grewelthorpe. Dau of Robert & Dorothy. Married to Leonard of Ilkley. MARY UMPLEBY. Bap 24.3.1843 Kirkby Malzeard. Dau of George & Margaret. In 1871 Married Robert Drysdale Reddie. in Manchester. MARY UMPLEBY Born C1847 K. Malzeard. Died 1885. Dau of Leonard & Mary. Married James Watson of Kirkby Malzeard in 1866. MARY UMPLEBY [nee?] Born C1855 Kirkby Malzeard. Wife of Charles of Langcliffe. Living Settle in 1901. RICHARD UMPLEBY. Born C 1748 K.Malzeard. Died 1824 K.Malzeard. Son of William & Ann Baynes. Married Jane Beckwith. in 1771. RICHARD UMPLEBY. Born C1777 West Tanfield. Died 1846 Kirkby Malzeard. Son of Richard & Jane Beckwith. Married Mary Craven. in 1799. RICHARD UMPLEBY Born C1830 Laverton. Joiner Carpenter. Brother of George. RICHARD UMPLEBY Born C 1841 Dallowgill. Son of George & Mary. He was a brewer. ROBERT UMPLEBY – Born C1853 Grewelthorpe. Son of Leonard & Mary. Farmer married to Dorothy. Living Park Hse. Markington in 1901. ROBERT W. UMPLEBY Born 12 May 1892 Grewelthorpe. Son of Robert & Dorothy. Unmarried retired farmer living Kirkby Malzeard in 1939. SARAH UMPLEBY. Born C1776 Kirkby Malzeard. Dau of Leonard & Sarah Burrill. Married John Fryer. in 1799. SARAH UMPLEBY Born 1816 Grewelthorpe. Died 1899 Leyburn. Dau of Leonard & Jane Bradley. Married Joseph Horner she was a visitor in Grewelthorpe in 1861 with the Robinson family. WILLIAM UMPLEBY. Born C1707 Carlsmoor. Died 1785 Dallowgill. Son of George & Frances Bayne. Married Ann Baynes. in 1734. WILLIAM UMPLEBY Born C1798 Thornborough. Died 1843. Married to Elizbeth Hebden of Fellbeck in 1821. WILLIAM UMPLEBY – Born C1847 Kirkby Malzeard. Son of Leonard & Mary. Farmer married to Ann of Galphay.